Welcome to our guide to garage storage ideas. The garage is one of the most neglected spaces in any home, but in reality it is just as important as any part of your house. It is not just a place to park you car, but it has become a multi functional space where you can store different items or enjoy different activities. Below you’ll see the most popular garage storage options for cabinets, tool chests, bikes, overhead, shelving, and DIY storage designs. Organizing one’s garage is considered by many as a stressful activity. Contrary to this belief, it is an easy home improvement task that doesn’t have to be overlooked. Just like designing any part of your home, it requires attention and ample time to plan. Optimizing your garage to its fullest potential can be done with a few simple tweaks without having to spend much. The key to a better looking garage is to organize your stuff using different garage storage ideas. From seasonal items such as canoes, camping stuff, outdoor gear, sporting equipment, holiday decors to frequently utilized tools and equipment, the garage has become a place where people store a large amount of their stuff. Garage storage systems are a great way to take advantage of unused area and convert it into a well organized space. There are many available options in the market which depends on one’s needs. Whether it may be open shelves, solid wall systems or simple hooks, these solutions can go a long way. Expands your home. It is common to find things usually scattered in garages, and usually this is simply because there is no proper storage for these items. 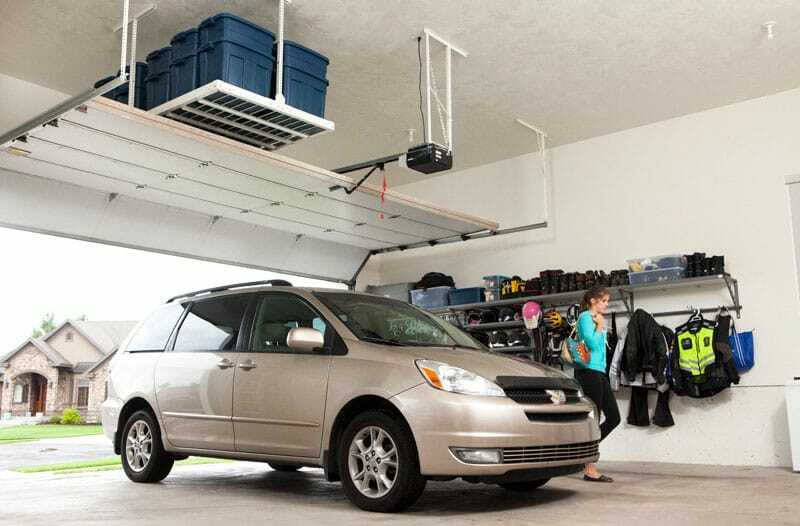 Reorganization frees up space and helps you maximize your garage space. Multi purpose space. Garage storage can help you convert your garage into a multi functional hub or an “all in one” space. With simple storage solutions, you can now use your garage as a mudroom where you can leave outdoor gear and shoes to protect your home from dirt, a work space where you can enjoy DIY projects and crafts, a gym to spend regular workouts , a man cave to spend a relaxing afternoon or a family friendly game room where you can bond with kids. Saves money. Finding the proper storage will help you fit everything within your home, eliminating the need to rent a separate storage unit. Clears out clutter. As we accumulate things over the years, it is a bit hard to prevent clutter from piling up within our homes. The right storage solution will help you sort out things which you do not need anymore and hide things away from the line of sight. Improved storage. Garage storage provide a well organized home because this allows you to store, group and categorize your stuff based on their type. For example, garden tools are hanged on hooks, tools are all placed in one corner, etc. Adds convenience. Proper garage storage systems allow you to find and manage things easily. Since things are well kept and organize, there is no need to go over each storage bin or cabinet and look for something you need. Effective work and traffic flow. 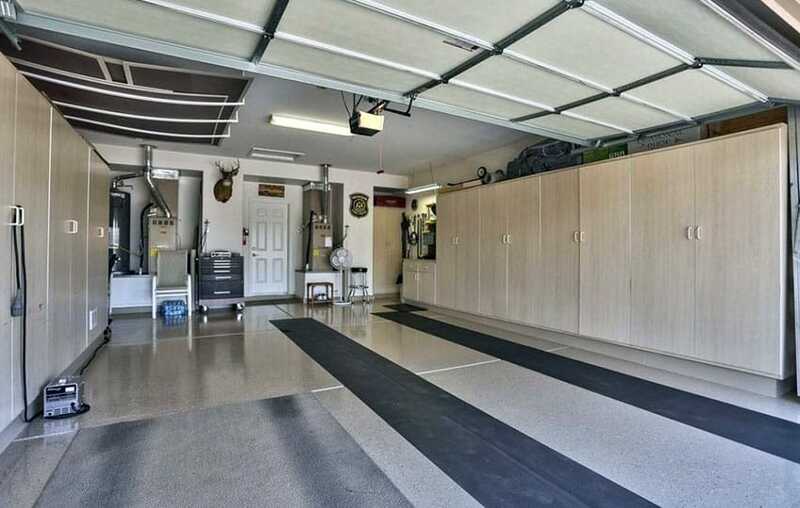 A well optimized garage allows you to freely move around. 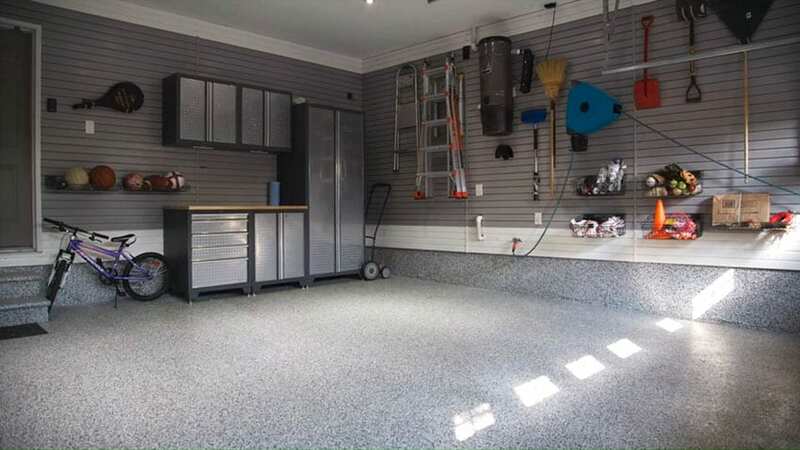 Since there are no things laying around the floor or scattered in places, it allows for a more effective traffic and work flow within the garage. Equipment management is also efficient. Peg boards or hanging gardening gear make tools available within a hand’s reach while working on projects. This make you save on time and effort as well. Enhances the look of your garage. Garage storage are not only considered as a functional addition to your home but as a decorative feature as well. A well organized garage is aesthetically pleasing to the eye. Check out this page for more ways to enhance your home with garage door colors. Adds value to your home. A few upgrades will make the resale value of your home higher and increase your home selling prospects. A usable work and storage space is desirable to buyers. How much does it usually cost to add storage to a garage? The typical cost for adding storage for a garage makeover usually range from $740 to $2400 per project , with an average cost of $1400. “Do it Yourself” projects can usually be accomplished with a $1000 budget or less. However these estimated costs can still go higher or lower depending on the materials used, the type of storage system and the labor contracted. If you plan on taking on garage reorganization as a “Do it Yourself project”, garage shelving units with wall shelving are usually sold in home improvement stores at $50 per piece. Larger shelving units are typically $200 per piece, while hooks are sold at a very affordable price of $10 to $20. Professionally installed storage systems are generally more expensive. Custom garage storage shelving are usually $1200 to $1500 per lot. For more complex systems which have a combination of shelves, cabinets, a flat wall storage and work area, the project costs can go up to $3000 to $5000. When it comes to labor and installation, you can either install it by yourself or hire a professional to do the work for you depending on the complexity of your storage system. 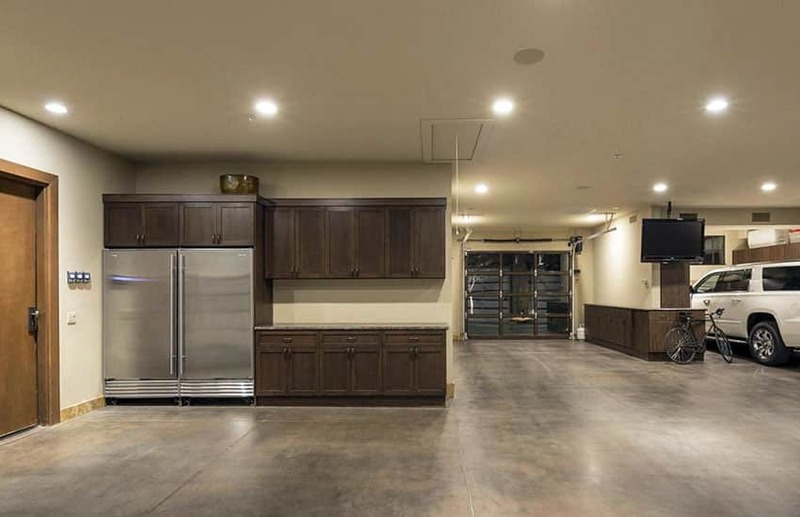 Professionally installed garage storage systems guarantee not only a quality product but also helps you choose the most appropriate design for your space. Contractors can provide useful input in the design and planning process while helping you find the “best fit” for your home. Materials for this type of project are available in local home improvement stores or specialty suppliers and manufacturers. Other options are are also available online. 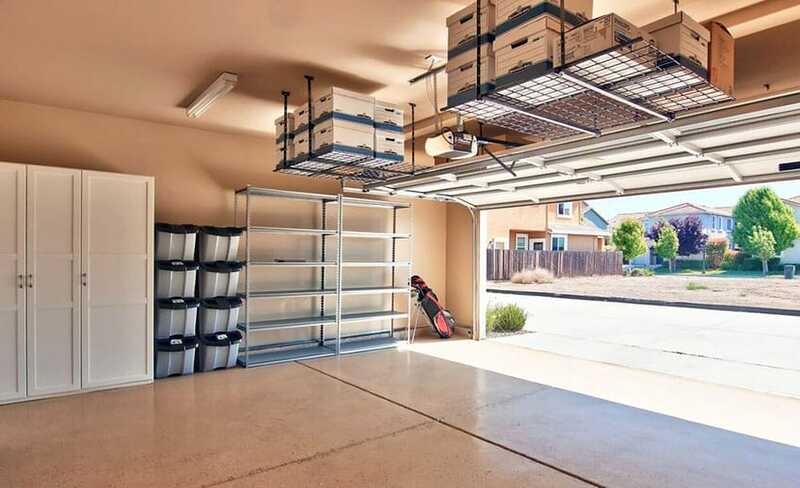 There are three main type of garage storage namely : cabinets, shelving and overhead storage. Each has different advantages and will work depending on your needs. 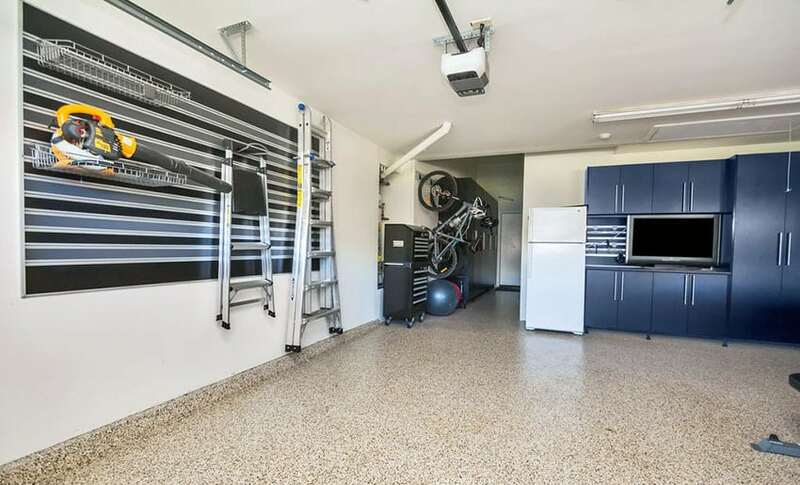 The best option for a well optimized garage storage system is to combine the three. This will allow you to store all your things depending on their type, size or frequency of use. How do you intend to use your garage? Are there any other specific activities you want to do in your garage? Example: crafts, work, exercise, hang out, play games, etc. How much stuff do you need to store? What types of items do you need to store? Among these items, which will be used most frequently and which are seasonal? Do you need a storage for big items such as canoes or bikes? Do you want a built-in or mobile storage? Should the storage system look like furniture? After determining the purpose, you can now proceed with settling the overall look and feel of the design of your garage. Next step is to establish the budget . Another key tip which you can consider in planning and organizing your garage storage is that a little investment can help you go a long way. Investing on quality products may require a bigger budget but will definitely pay off in the long run because they are more likely to last over the years. What are the common materials used for garage storage? 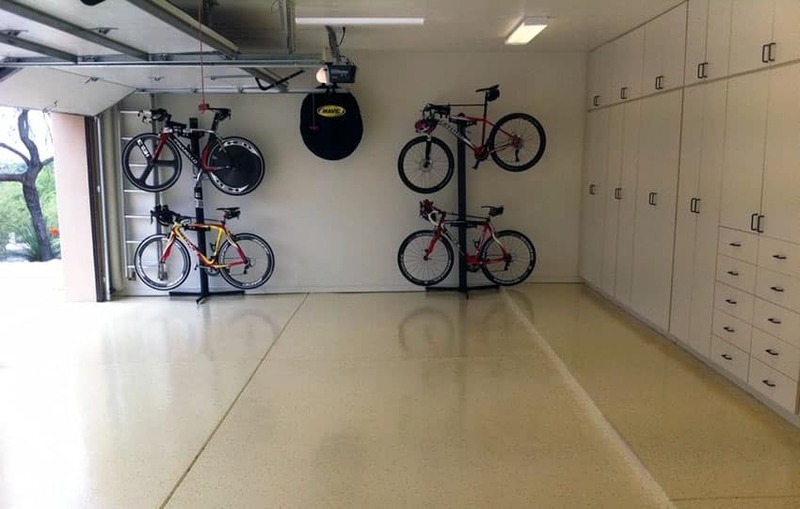 When it comes to materials, the most popular material for garage storage systems is metal. 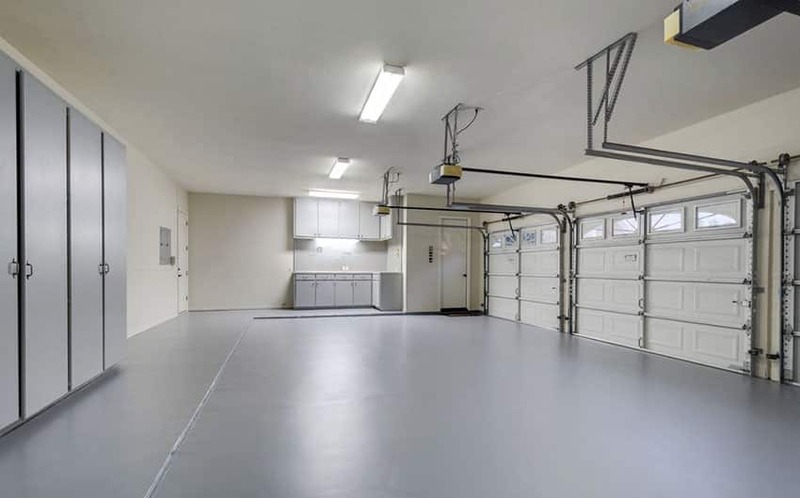 Although expensive, metal garage storage systems are proven to be an effective investment because they can support varying amounts of weight and can endure everyday wear and tear. Since it is heavy duty, it can handle even large objects such as bikes or canoes. One drawback of using metal is that it is prone to rust, so make sure that it is enhanced with a rust proof treatment before use. Plastic is also a common material used in garage cabinets and shelves. Inexpensive and proven to be stain and chemical resistant, it is waterproof which makes it resistant to warping, rust and molds caused by moisture. Although affordable, it does not offer the same aesthetics that wood has because it has limited design options. Aside from that it is only advisable for light duty storage. Another common material used for garage storage systems is wood. Wood is highly preferred by a lot of homeowners because of its versatility. It provides more options when it comes to design and is also inexpensive. However, wood is prone to termite infestation, rotting, warping and cracking that is why it requires periodic treatments and maintenance. Wooden garage cabinets also come in other forms such as plywood, hardwood, MDF (medium density fiber board) or particle board. You can also apply a stained, laminated or painted finish depending on what suits your personal taste. In here you will find different garage storage ideas and design inspirations. We will also be discussing each type more thoroughly as we cover their descriptions, positive and negative features and their costs. 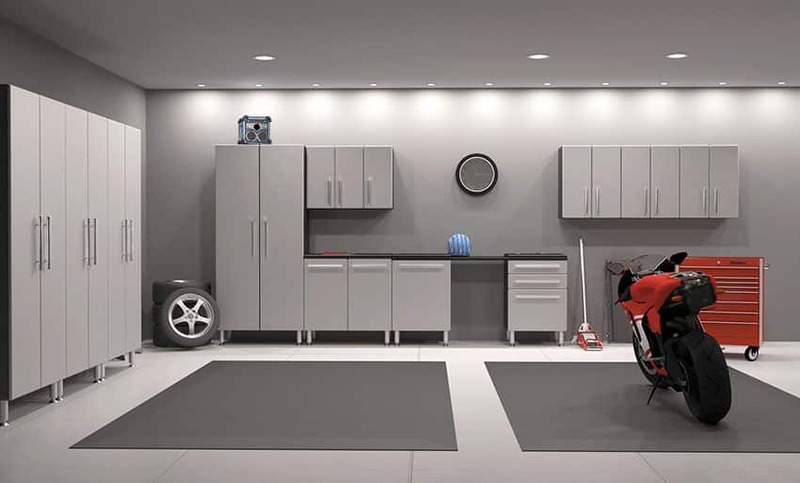 Read on and discover which type of garage storage is the best one for your home. 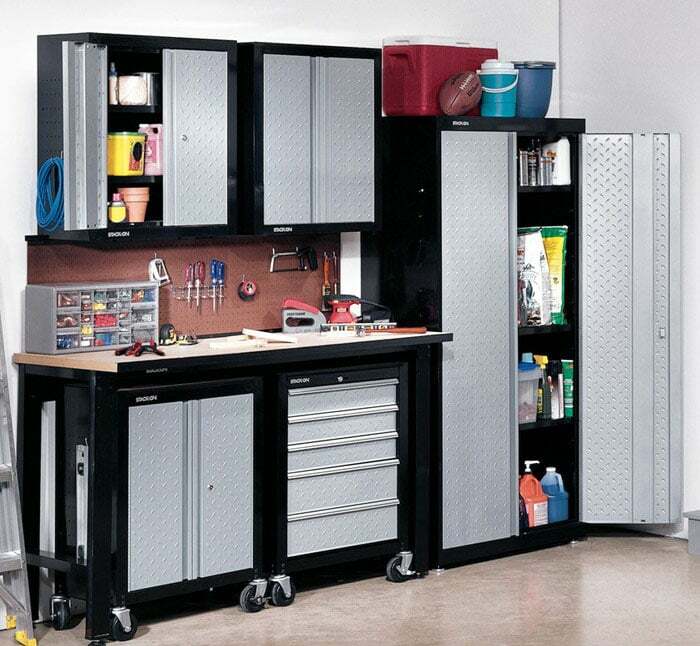 A garage storage cabinet is the most popular and most convenient way to organize garage clutter. Although it takes up more space, its greatest advantage is it conceals the clutter. It provides a space for both small and large tools, gear and equipment while keeping all the mess hidden behind a beautifully designed and crafted door. Design wise, garage storage cabinets are versatile because they come in a variety of shapes, sizes, colors and finishes. Cabinets are also highly customizable and can be modified according to one’s needs. Another advantage of garage storage cabinets is that there is no danger of falling objects over your car or belongings being pushed beneath it. It offers protection to your car since all items are safely stored away. Garage storage cabinets come in a variety of materials such as natural wood, plastic, metal, MDF or particle boards. 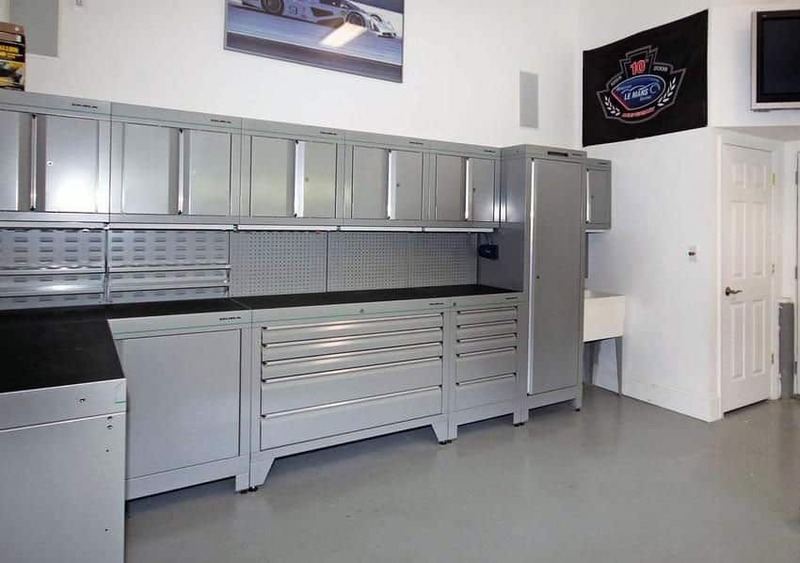 It is also considered to be more expensive than other garage storage systems with prices averaging from a minimum of $100 for one freestanding open cabinet. Modular garage cabinets are also popular in the market as they are a top choice in terms of flexibility. Modular system help maximize spaces as the cabinets are perfectly matched and custom fit to the available space in your garage. It is also a great way to save on money because it gives the opportunity to for you to buy only what you need. It comes in a variety of designs, hardware and is usually purchased per set. Floor to ceiling cabinet systems make the most out of garage spaces by giving the maximum amount of storage. The white cabinet system shown in the picture is not only functional but also gives the area a clean airy feel and spacious look. 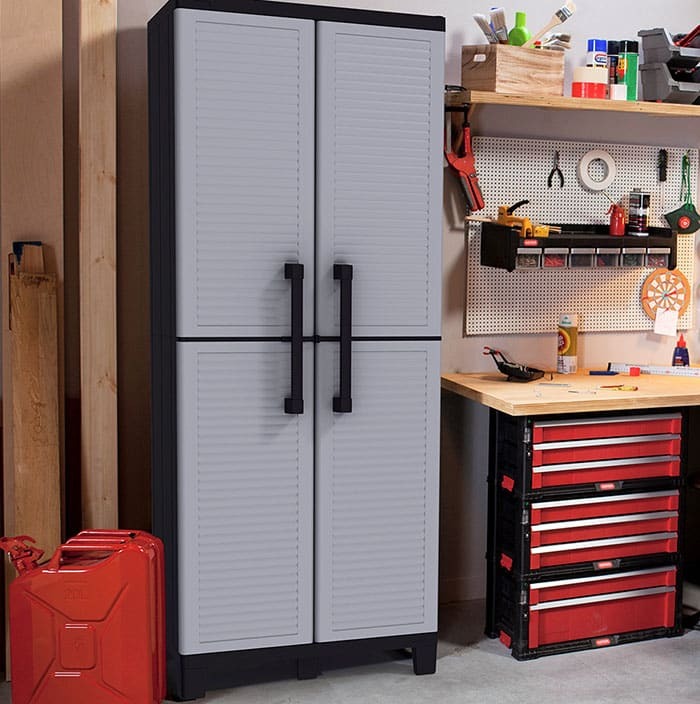 Covering 30 feet of garage space this cabinet system provides plenty of storage for tools and other seasonal items you’d like safely stored out of sight. The combination of different cabinet systems such as overhead cabinets and under counter cabinets give ample room for storage and provide a working counter which can be used for different activities. Plastic storage cabinets are readily available in home improvement stores or even online. Aside from being affordable, its compact size allows it to be easily tuck in corners while providing storage for a variety of items. 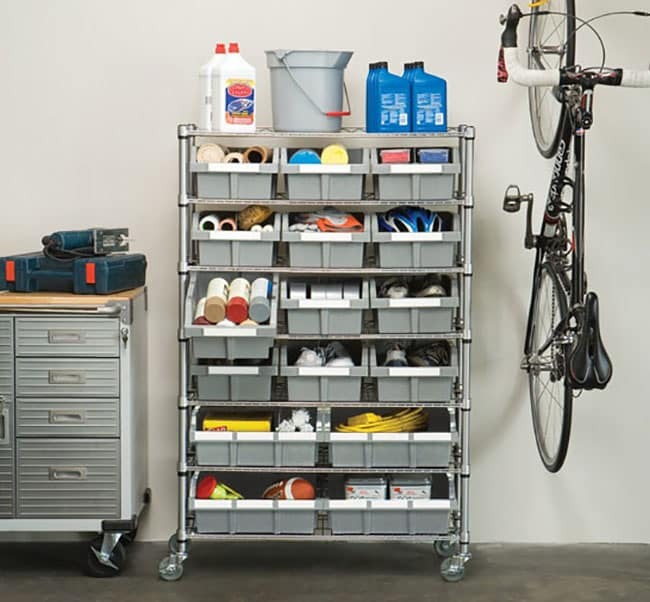 Although expensive, this heavy duty metal garage storage set keeps your things well organized as it comes with different drawers and compartments. Since it comes in a set, you do not have to worry about individually planning the pieces together. Bicycles are not only bulky but also a bit award to store. Ideally, bikes are either mounted on walls or ceilings to keep them out of the way. The simplest way to do this is with the use of claws or hooks which are relatively inexpensive. Other options for storing bicycles include using pulleys or hoists. Bike lift hoists are usually armed with a safe locking feature and can support up to 100 pounds for up to 12 feet in height. Bike racks or wall bike stands, on the other hand, are mounted on walls and can support up to 2 bicycles. Bike storage systems typically cost around $20 to $200. 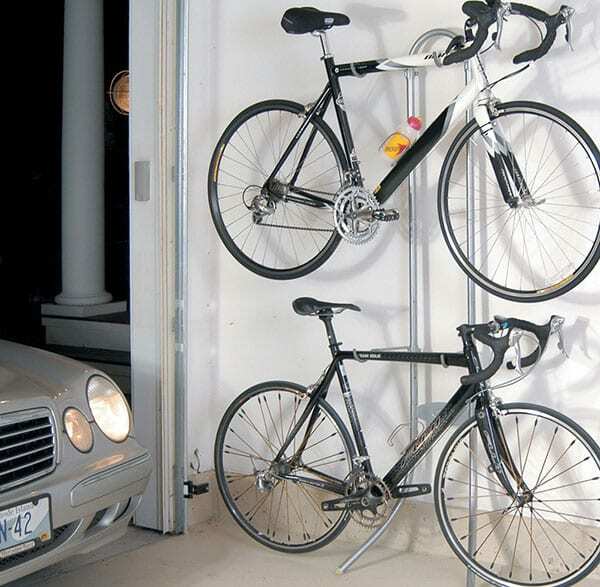 Garage storage ideas for bikes often go vertical or overhead during the off-season to keep bikes tucked away for times when they are not needed. 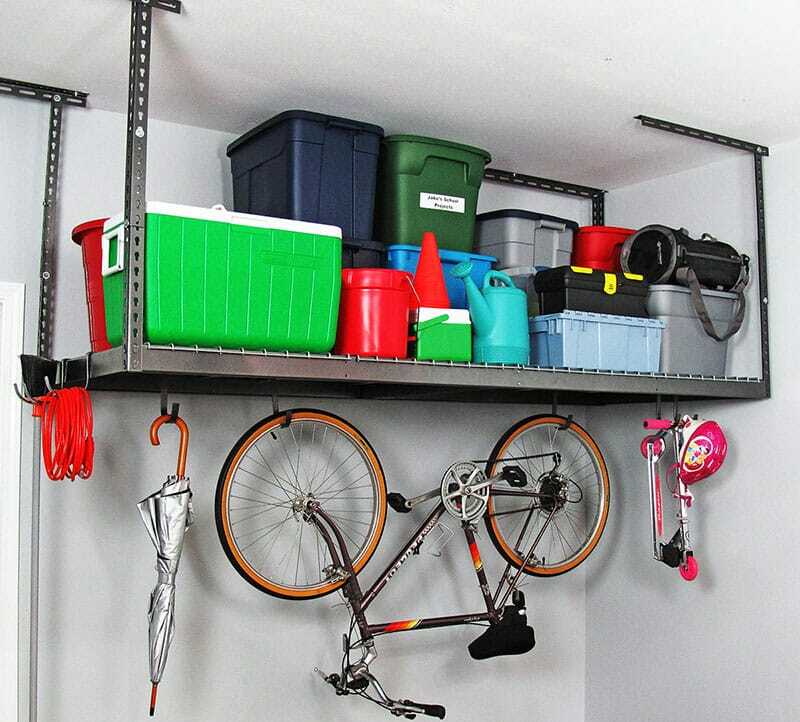 Bicycles may be hang on ceiling to free up floor space and prevent them from scattering around your garage. This easy to assemble bike stand does not need to be mounted on walls and can store 2 bicycles without taking up much space. 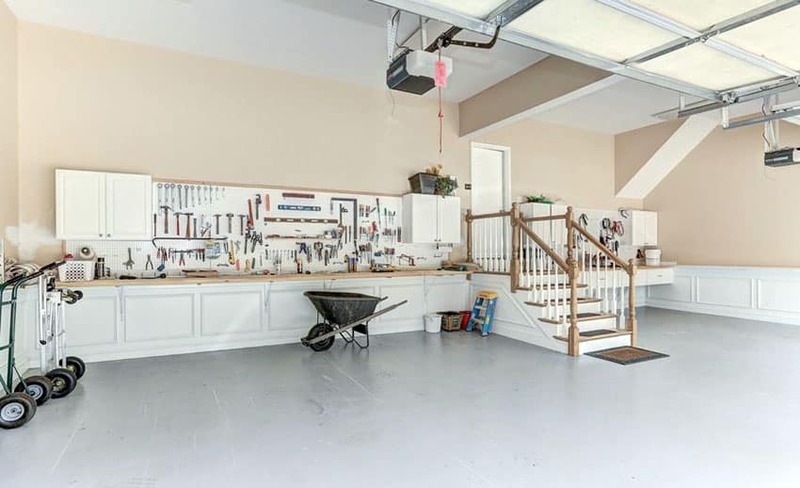 The garage is considered to be the “tool center” of the home. Being a place where the car is parked, it is just appropriate to store all tools and equipment for maintenance and repair here. Not only is it a place for storage but it also serves as a workshop so one of its main requirements is the efficiency of a work space. There are several options for tool storage whether it may be movable or built in. A mobile tool box allows tools to be moved easily around the garage while you engage on repair works in your car. For homeowners who want a more organized way to store tools, one option to explore is the peg board. The peg board is an inexpensive and practical way to free up floor space in a garage because all tools are hung on hooks in a wall. Since everything is on display, there is no need to rifle through drawers and search for what you need. 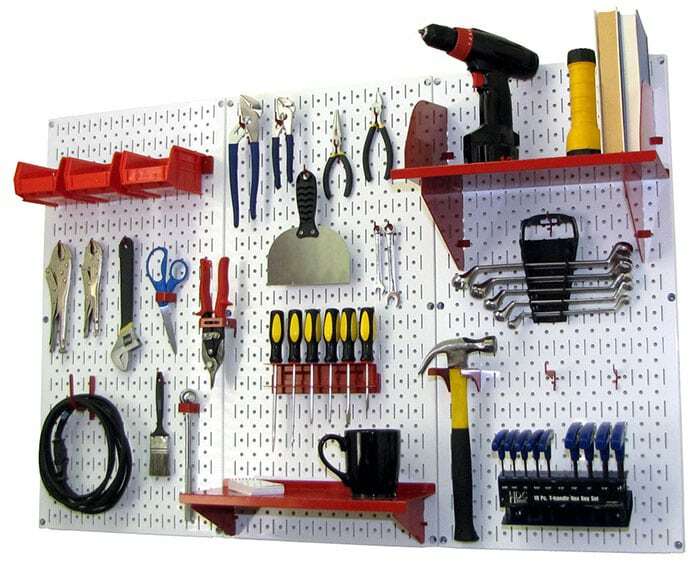 In some cases, a tool pegboard is combined with a built in workbench. A more affordable and simple way to hang tools is with the use of a magnetic strip. Vertical wall slat systems have grooves which allow for insertion of wire baskets and hooks. This design also shows a combination of different garage storage system types which makes organization fully optimized. Peg boards keep tools in full display keeping everything within reach and easy to find. 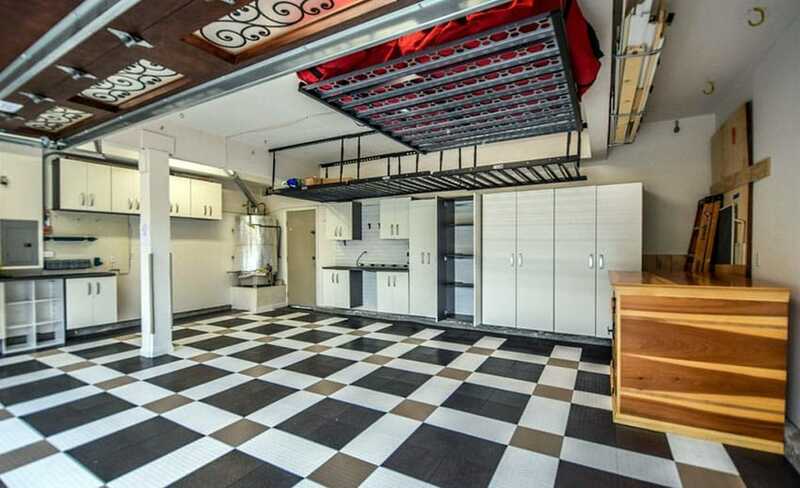 Overhead garage storage are an ideal solution for optimizing and maximizing rooms. It makes use of boards in a rack system that are mounted to the ceiling. This is securely fastened by attaching the rack to ceiling joists through the use of bolts. Ceiling brackets are used as connections making it adjustable. It is usually made up of industrial grade heavy duty steel in a powder coated finish. Because it is off the floor, it frees space making room for your car and allowing for more area to move around freely. Its benefits include easier accessibility for cleaning and sweeping. Items are also less prone to trapped moisture because they are not in contact with the floor. It also gets clutter out of the line of vision. Its drawback, however, is that it is not easy to reach and would sometimes require you to use a ladder in order to access something. It is an ideal storage system to keep less frequently used items out of the way. This makes it highly suited for storing medium to large items which are seasonal and rarely used such as camping gears, canoes or skiing equipment. This type of storage system is often used with plastic storage bins. Just make sure that if planning on doing so, use clear storage bins so that you can easily find items or you can also attach labels to each bin. Overhead garage storage systems can cost anywhere from $100 to $400 depending on the type and size. Its durability allows it to support approximately 300 to 600 pounds. It proves to be a wise investment because it can last for a long period of time and usually comes with a lifetime warranty. Overhead metal racks can support the weight of heavy items so it is highly suitable for keeping storage bins and seasonal items such as luggage bags. The storage shown above can be installed above a garage door, making it even more space efficient. 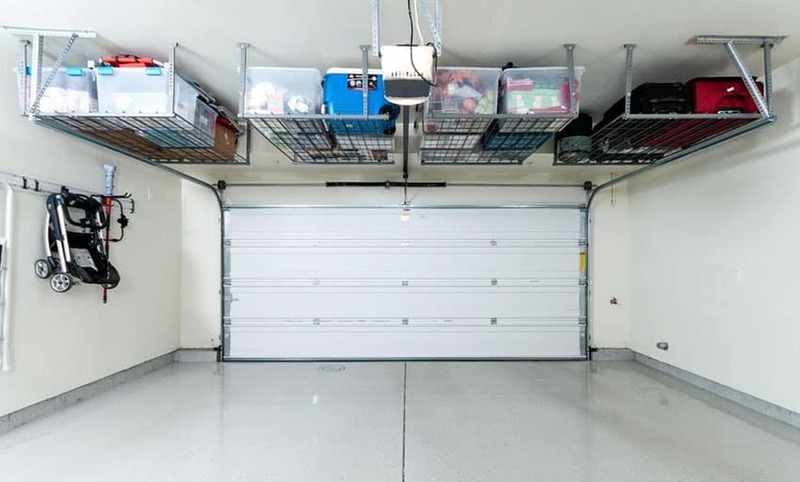 Garage ceiling storage systems are similar to overhead storage systems. Both types utilize spaces in the ceiling and clear up floor space. It also highly advisable for storing items which are unused on a regular basis. When it come to advantages, they basically have the same positive features. The downside for ceiling storage systems are dependent on the type of material used. The most common type of garage ceiling storage system is the metal overhead rack which is ready made and ready for installation. This type was discussed earlier. Another type is the wooden ceiling storage which is made up of a fixed cantilevered wood panel which is bolted to the ceiling and supported by studs. It can also be constructed with a tracking system if you want the whole thing to be movable and adjustable. Wooden ceiling storage systems are common “Do it Yourself” projects despite being tricky to install. Compared to other types of garage storage systems, it requires medium effort to install because of its simple design. With careful lay-out and proper planning, it can help you save on money. Other ceiling storage systems incorporate shelving or hooks within its design. Ceiling mounted metal racks usually have a mesh design which allows for hooks to be inserted enabling storage for bicycles. Sliding storage systems which hang from the ceiling frees up floor space giving you more room for other activities in the garage. For a more effective storage solution, combine modular cabinet systems with overhead ceiling racks. 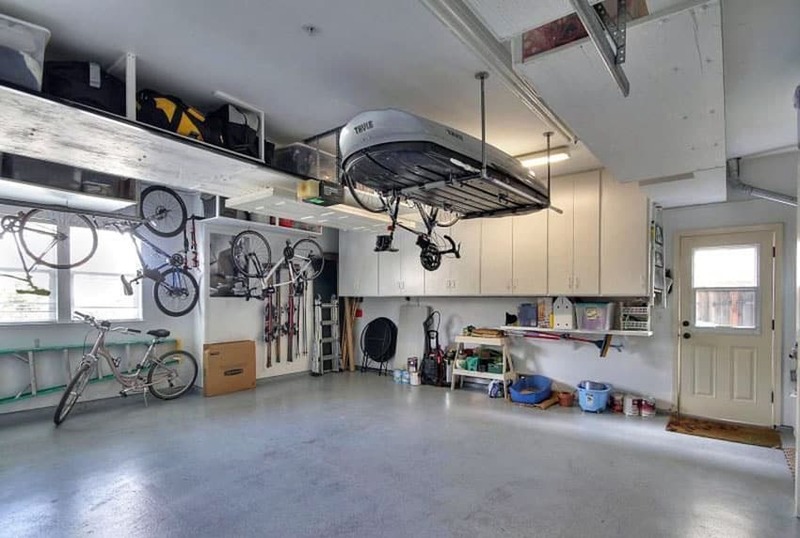 A well organized garage storage system gives more room for parking space. Made up of heavy duty steel, it is durable enough to support the weight of large stacked storage bins. Hooks can also be added to overhead storage racks and can be used to hang bicycles, umbrellas or long handled tools. Garage storage racks are ready made freestanding shelving units which may be placed near the walls or even in the middle of any garage space. It is usually made up of heavy duty plastic or durable metal and is either stationary or with wheels which allow for mobility. Storage racks are also adjustable and easy to configure. Requiring little effort to assemble, it is also very affordable typically ranging $30 to $100 for a 4 to 5 tier set. 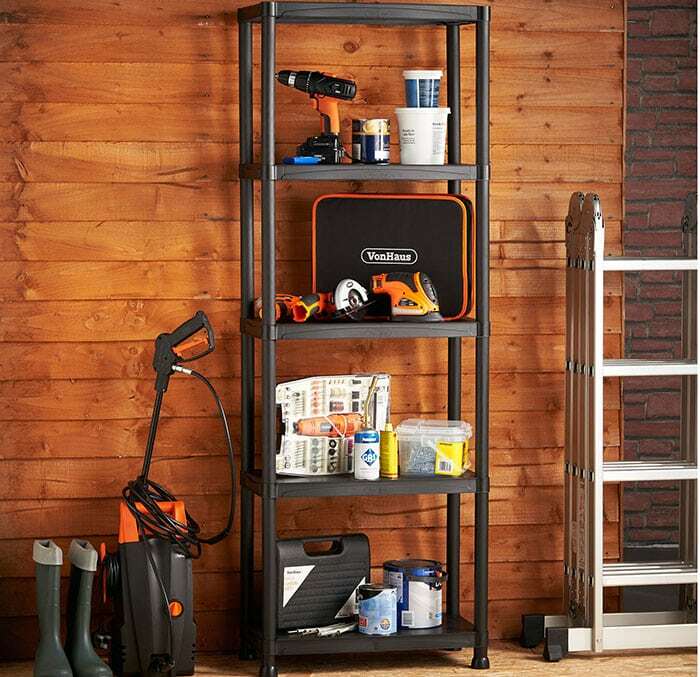 Garage storage racks are available at home depot and local home improvement stores. Some advantages of using garage storage racks include flexibility in use as it is multipurpose and can be used to store a variety of items. Objects which are stored here are highly visible and accessible which makes it appropriate for stashing small to medium frequently used items such as seasonal clothing, pet supplies, cleaning equipments and boxes. Maintenance wise, it is easy to clean requiring only occasional wiping. Another positive feature of storage racks is that the load it carries is evenly distributed that is why it is not prone to breaking or sagging. Metal rack shelving are made up of heavy duty steel and are affordable storage solutions for displaying frequently used items. Storage racks with wheels or casters are perfect for storing small items such as home improvement materials or car maintenance supplies as it can be moved around the area when you need them. Plastic rack shelving is lightweight yet durable and can be used to store tools without having to worry about getting damaged by exposure to moisture. Garage storage shelves are the most effective, most convenient and easiest to install out of all the types of built-in garage storage. Since items are kept on display at an eye level, it is easy to find what you are looking for. 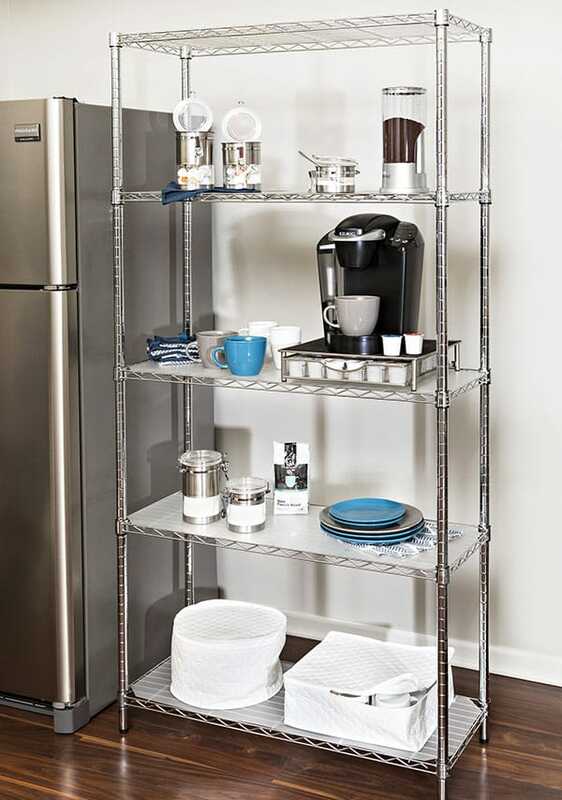 Open shelves also allow for easy accessibility because it keeps everything within reach. With such, it is highly suited for storing small to medium sized items which are used more often and are handy at the moment. One of its drawbacks is that there is a possibility of falling items. Garage storage shelves may be constructed as a single piece or in multiple tiers. Just like garage cabinets, the most common materials for garage storage shelves are plastic, wood and metal. Plastic shelves are a quick, easy, cost effective and maintenance free storage solution. But its low quality can not support weight. To ensure that it is durable enough to support heavy weights, you may purchase high end plastic shelves which are more costly. Wooden shelves, on the other hand, are easy to work with and are highly flexible as it can be cut to fit specific needs. It is also durable and has a distinct natural aesthetic appeal which cannot be matched by any other material. However, wood must be subjected to treatment because it may warp, crack or rot given that garages are exposed to moisture due to their poor insulation. The last type is the metal shelves which are highly favored because of their durability. Heavy duty metal shelves can support a lot of weight over a long period of time. Aside from being affordable, it has a wide market availability. It is also easy to mount and and can suit different functions. The negative features of metal shelves include the susceptibility to rust and restrictions in design as it can not be altered to specific needs. This modular metal shelving kit comes in a set complete with a peg board for hanging tools and shelves for keeping tool boxers and other home improvement materials in your garage. Garage wall storage are efficient as it allows you to pack more stuff while keeping the floor space clear. It helps you find everything in an instant since all items are displayed within your sight. It is an ideal storage solution for frequently used small to medium items such as gardening equipment, tools and sporting gear. This type of storage system is appropriate for making use of the narrow alleys between the garage side wall and the car. Wall storage systems can cost a minimum of $100 depending on the materials used. It can be bought as ready made panel systems or may be constructed from scratch using a variety of materials such as wood, metal or engineered wood. Slat Wall System – A slat wall system is consisted of a wall panel that contains evenly distributed grooves. Hooks or shelves are inserted to the grooves. A versatile storage option, it allows for display of frequently used items and tools. It is usually made up of melamine plastic or wood and its price range anywhere between $100 to $300. Accessories such as hooks, tool holders, shelves, hangers and metal baskets are also available for purchase in the market. Peg Board – By definition, a peg board is a piece of board which has a regular pattern of small holes for holding pegs which can be used to display items. It is available in a wide array of materials such as wood, plastic and metal and has a lot of colors to choose from. Sold at a standard size of 4 feet by 8 feet, peg boards are affordable and can be bought at local home improvement stores for $30 to $ 200 each. 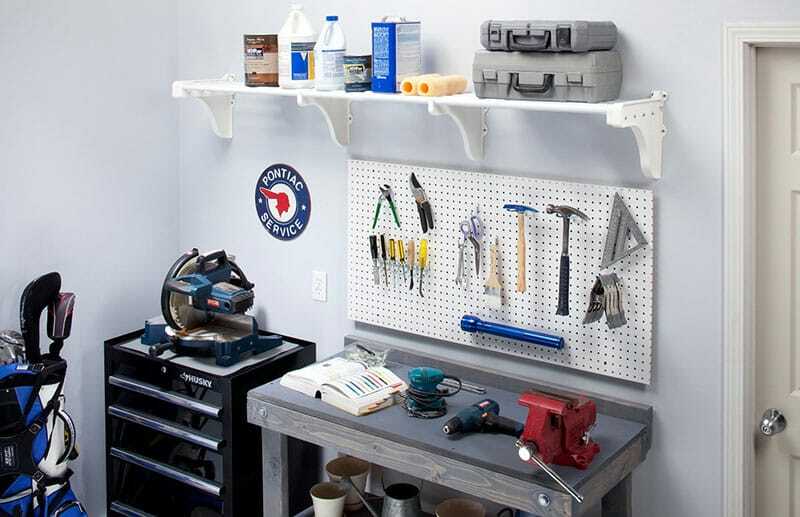 The most common use for peg boards in home improvements is for displaying tools in your garage. It eliminates the need to go over drawers as you look for the things you need and keeps everything within your reach. It is an ideal addition for workspaces as it ensures an uncluttered space and effective workflow. Adjustable Wall Shelving – This type of garage wall storage system is easy to install and can be done without the assistance of a professional. The key to constructing this system is attaching strips of plywood to a metal wall stud with the use of screws. Any type of storage hardware can be mounted to the wall system because it is adjustable and the levels can be modified depending on your needs. Since wood will be used for adjustable wall shelving units, make sure that the materials are treated first so that it can withstand the exposure to moisture and resist warping, rotting, decay and termite infestation. Adjustable wall shelving usually costs $100 to $500 depending on the design, size and the number of tiers. It can be finished with varnish, stain, paint, high pressure laminate or left in its natural color. Metal peg boards can display a large amount of tools without taking much space. It is also a convenient addition to work spaces as it eliminates the need to go over drawers when you need tools. Plastic storage bins are affordable and ideal for storing any type of items. Place them on top of heavy duty metal racks for ease of access. “Do it Yourself” garage storage systems give you more room for creativity and allows you to customize the design according to your personal needs, preference and taste. For homeowners who have the spare time and want to save money in terms of labor costs, then this might be the right option for you. 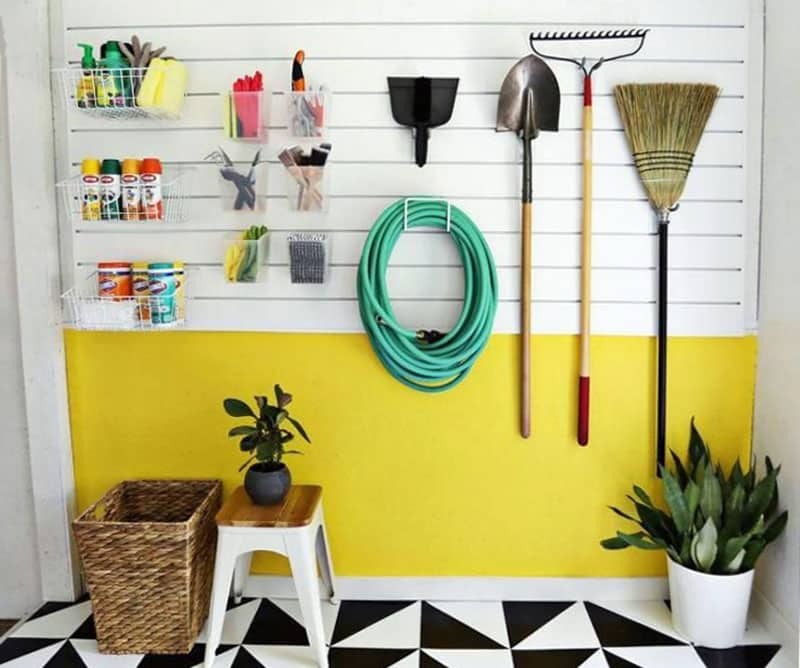 DIY garage storage ideas are a great way to put old or unused items into good use. For example, a salvaged wood panel can be used as a pegboard or may be cut into several pieces and converted into shelves. Scrap wood can be used for organizing smaller tools and items. Old jars and bottles can serve as containers for nails and screws. The possibilities are endless when it comes to DIY garage storage as long as you are resourceful and creative. Prepare. Aside from determining the purpose, style, design, budget and type of project, you need to prepare the space. Preparation includes decluttering your garage. You can do this by sorting things which you want to keep, you need to throw or you want to donate. Remember, you need to free as much space as you can. 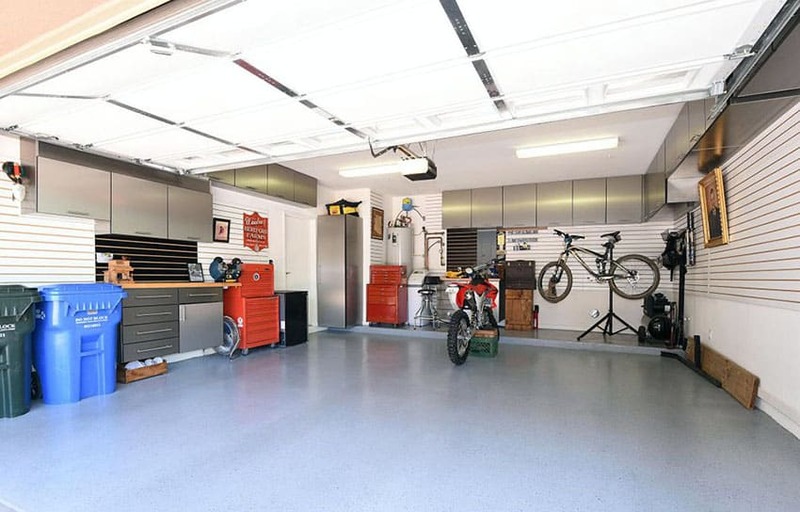 Categorize the items in your garage. Typical categories include : cleaning materials, house maintenance and repair, pool equipment, sports gear, recreational items, gardening tools, holiday decorations, car tools and crafting materials. Also upon going through your things, avoid storing items which are dangerous and do not stand up well when exposed to elements. The garage is constantly exposed to dampness, moisture and extreme heat. Sort garage contents into piles of related items. Once you have decided on the categories of the items which will be stored in your garage it is time to group them. Consolidate similar items together. Put them in cardboard boxes first. One common mistake is buying the storage bins right away and discovering later that you have the wrong size or they do not fit in your garage. You may also want to keep a separate box for items which will be recycled. Decide on your layout. 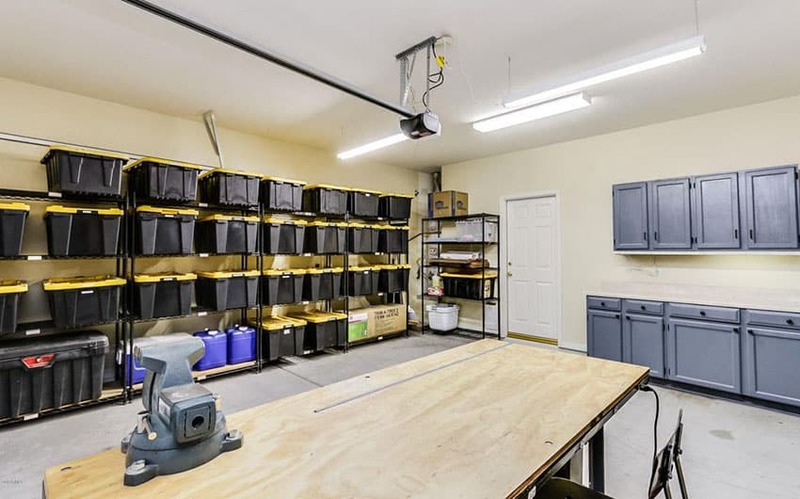 Determine the best layout of your garage and assign specific places for each type of items you will be storing depending on their frequency of use and size. Keep frequently used items within your reach and your line of sight. Tools must be kept near the workbench. Seasonal items may be stored in plastic stackable bins since they will not be used regularly. Add storage. Now that you already have an idea of how much items you will be storing, you can now also determine the type and amount of storage you need. Install wall shelving, cabinets or overhead storage systems. If needed, you can also use modular systems. Combine these types to get an optimized garage storage solution. Utilize the ceiling space. Take advantage of your ceiling by building a loft as it frees up floor space and does not obstruct the traffic flow within your garage. It actually gives you car a place to park in without being mixed with clutter. Use floor to ceiling storage. Maximize your space by going vertical. Slat wall storage systems, peg boards and wire grids are all wall mounted systems which can be used to store and display regularly used items like tools, sports equipments or gardening materials. Reuse. Repurpose items such as bins, trash cans or bottles and jars to store small items in your garage. Pulleys and hoists – These work well for storing large and bulky items without taking up valuable floor space. It is ideal for organizing kayaks, canoes, wheel barrows or bicycles. Hooks – Hooks are an inexpensive storage solution which is readily available anywhere. It is ideal for hanging and storing bikes,outdoor clothes, long handled items such as garden tools, pool equipment and sporting gears. Hanging rails – Just like hooks these are appropriate for sports gear, bicycles or gardening tools. Mobile Storage Systems – These are storage units that come with casters which make them easy to move across the garage. It is ideal for keeping small car tools and home maintenance tools. Wood and nail hanging rack – These easy DIY garage storage ideas are a quick and very simple storage solution as they only requires a single piece of wood with exposed nail heads for hanging stuff. It is ideal for organizing garden tools like rakes, trowels and shovels. Finish this off with a nice paint finish to make it aesthetically pleasing. Slotted rack – This simple storage solution can be built with reclaimed wood and scraps. Join pieces of wood together to make a rectangular box then divide it into open compartments. The individual slots are ideal for storing long handled items. Repurposed items – Used bottles, jars or plastic containers are perfect for storing small items such as screws, nails or bolts. Glass jars give you a clear view of what’s stored inside them so you can easily see what you need. Side from that it is an environment friendly solution since it makes way for upcycling.